I created this costume for my 9 year old son. We enjoy making illusion costumes that get people to stop and think. His head is in the box. 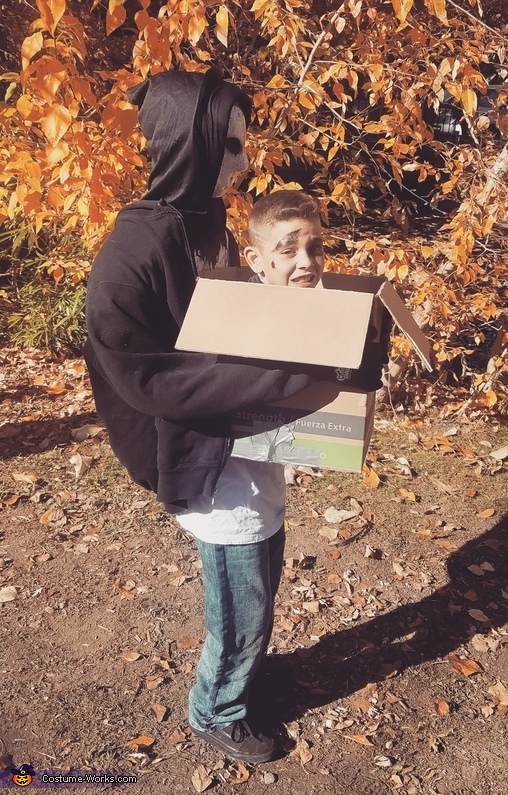 We created the illusion to look like someone is carrying just his head. The legs of the "person" are actually his legs. We used styrofoam to create the torso of the body and then used plastic bags and bubble wrap for the arms. We attached a styrofoam head to the torso and then put a mask on it. We put a tshirt on the torso and then used a rope to attach it to the box. We then used a mens L jacket to put on the torso and put the arms in. The arms were attached to the box with rope as well. In the box we used suspenders that my son could wear to help hold the box up. We had to duct tape the suspenders so they were not stretchy. We also had my son wear a size larger in pants to fit the look of someone else carrying him. The costume held up great and confused so many people! It was a great success. We were able to make this for less than $50.